The Nieuwe Binnenweg is the road that connects the residential district Tussendijken to the centre of Rotterdam. The east section, closest to the city centre, is developing a reputation as trendy leisure place. The street, as a whole, features residential buildings, shops, restaurants & bars over a length of 1800 meters. The Nieuwe Binnenweg also connects the smaller residential streets in the area to the larger main routes through Rotterdam. All types of traffic can be found here, including trams, as the roads provide an important east-west tram route. The diversity causes a lot of conflicts on the road, as nearly all users share the some of the same space. The character of the street is inspired by its main function as collection and distribution road. Whether this is the right function is up for debate. For the eastern section, it clearly isn’t, but what about the rest of the street? 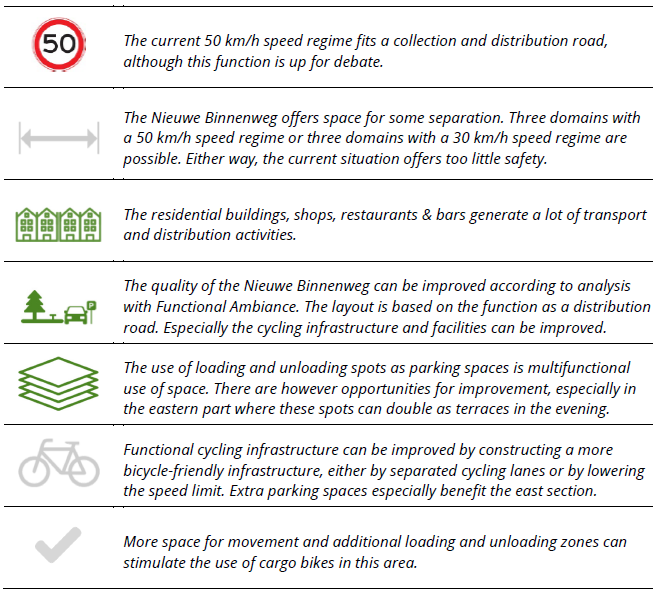 The ideal picture for the western and central parts of the Nieuwe Binnenweg is design based on three domains. A fourth domain for trams is not possible because of the limited space in the cross-section. The sidewalk and cycling paths are to be separated from the driveway. The space on the driveway is to be shared between light motor vehicles and the design vehicle, the car. Trucks and trams are allowed as guests. The current 50 km/h speed regime suits this layout. A potential alternative design is a 30 km/h speed regime. 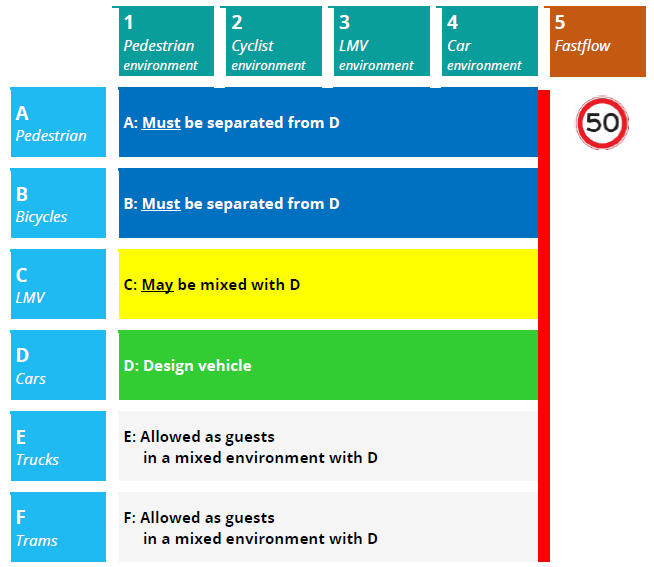 Then LMVs become the design vehicle and heavier vehicles can be allowed as a guest. Giving trams an own domain would allow for faster public transport, whereas mixing trams would allow for a separate domain for cyclists. It appears, from the scoring of the quality aspects of Functional Ambiance, that the current quality of the Nieuwe Binnenweg is mediocre. 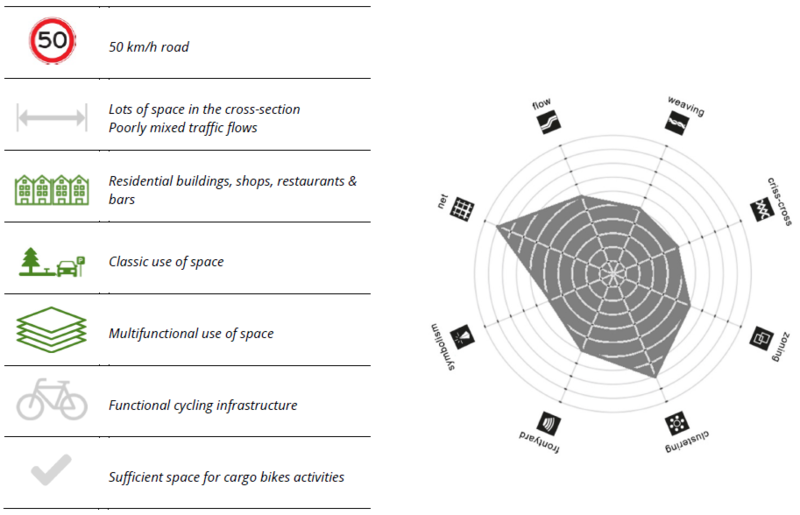 The arrangement of the traffic flows, the bicycle friendliness and the suitability for cargo bike activities are very poor. The flows of traffic can improve and the safety of cyclists can improve by separating the flows or by lowering the speed regime in accordance with Urban Mobility. A practical and easy to implement solution is to separate and widen the cycling path. The parking spaces would have to be removed for this solution, but this also creates an opportunity for bicycle parking spots. This way the public space can become more bicycle friendly and thus become higher in overall quality.